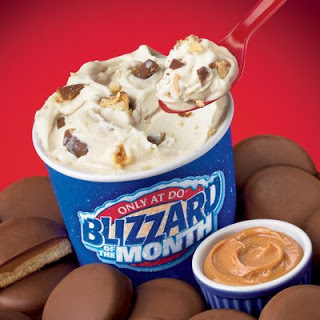 I meant to post this on Sunday, but we did make it out to DQ this weekend and when we got there I headed straight for the potentially awesome Girl Scouts Tagalongs Peanut Butter Patties Blizzard. Now I say potentially, because, well, I really hate to say it, but I wasn't real thrilled with my blizzard. 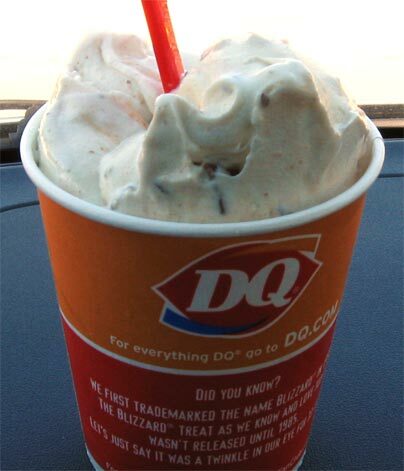 In fact, it makes me wonder how they measure the ingredients for the blizzard. Whoever did mine added way too much of the "creamy peanut butter". It was overpowering and made the blizzard kinda dry. I had to stir the whole thing up to try and mellow the flavor. As if that wasn't bad enough, the tagalong pieces were blended into oblivion. There were enough so that I did get a decent taste of them, but not any bites of them (not even at the bottom). The downside to a fresh treat like this is that you put your treat in the hands of a different person every time. Standard blizzards tend to be somewhat more predictable, but unfortunately, my blizzard of the month experience was no were near what I had hoped. 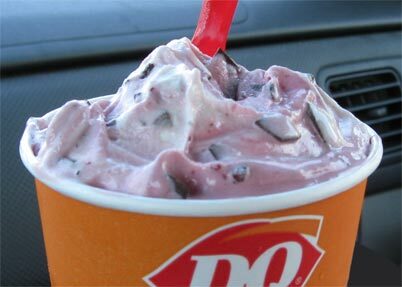 Alternate Ending: My wife went with the Choco Cherry Love Blizzard and was unamused. The description appears to be cherry topping and chocolate cone coating in vanilla softserve. I took a few sample bites and concurred that it just wasn't that good. It was a cheap cherry flavor with a funny aftertaste....instead of a chocolaty taste, it's more of a coffee taste, how weird.